Available in 12 different colors, these large (3 x 12 inch) bumper stickers are easy to read! Simply remove and install the bumper sticker when needed. No adhesive residue, no outdated old sticker "remains" on your vehicle. We can make your bumper sticker with standard lettering (colored text/white background) or reversed lettering (white text/color background). Price is just $9.50 each which includes shipping and handling. To order, use our SECURE convenient Bumper Sticker Order Form. 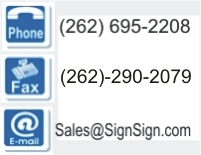 Or Email us your request to sales@signsigncom . Make sure you specify your text, text color, standard or reverse lettering, and payment information. We accept checks, Mastercard, or Visa. Most orders are shipped the next day.